By Sonia Tracy in Internet. Updated on April 9, 2018 . YouTube is one of those mega-popular websites that will probably never die. Businesses, realizing this, have started to create professional channels for their companies, mainly for marketing effort. If you’re planning to launch a YouTube channel as a marketing campaign, take the time to learn from the best. Investigate branding strategies of major players like Apple, Lady Gaga, and Disney Video Games to see what you can incorporate into your own channel for promotional efforts. The research will not only help you, it will also be entertaining! So here are 10 of the sleekest, beautifully designed and most visited YouTube channels for you to get inspired and impressed. You can also study them and implement their design into your own channel to make it beautiful and attractive at the same time. Check them out! 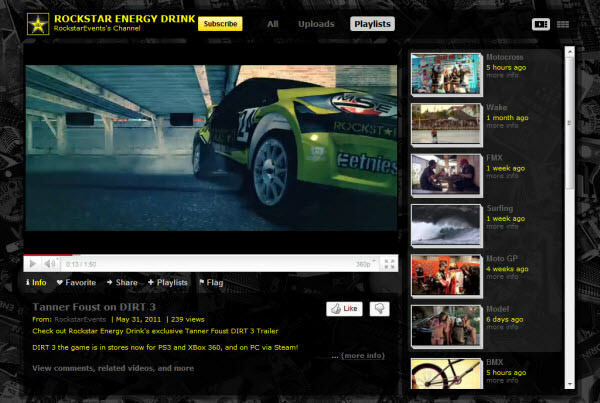 RockstarEVENTS is the official Youtube channel of Rockstar energy drinks, and it is designed with the black and gold color scheme that you’ll find the color scheme featured on its drinks can. The RockstarEVENTS channel has a unique background of gray and black Rockstar-themed items, cleverly strewn about like a collage of photographs. As another clever marketing trick, the word ‘Drink Rockstar’ can be found just above the fold situated on either side of the player’s screen. It’s also worth noting the featured content is mostly about extreme sports, like MMA, snowboarding, motocross, BMX biking, etc with the occasional hot model photoshoot thrown in for good measure. You’ll also find plenty of coverage of RockstarEvent sponsored music festivals as well! This is a bright, sleek channel with images of television screens and other icons associated with media. The blocky style on the middle part of the channel brings to mind both a unique game of Tetris and the pixilation that occurs in a digital photograph or on a television screen to present to you a complete image. Both analogies inspire a tech and media feel to the whole channel which fits perfectly with their product line and branding! SamsungTelevisions Channel also features a lot of white with complementing accents in bright, cheerful colors. 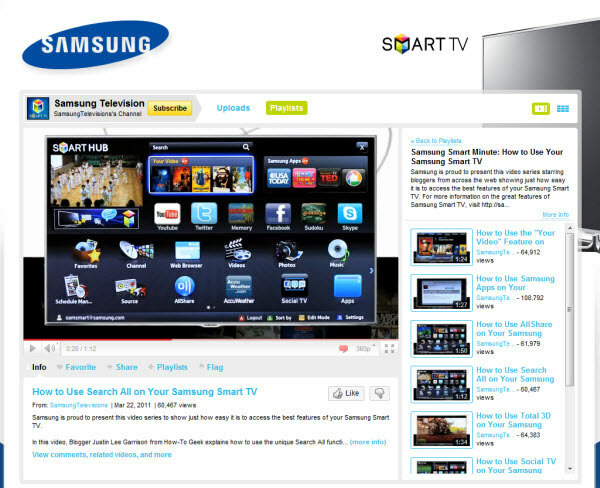 The featured content is tutorials on Samsung products laid out in your typical yet simple how-to style. Most of the tutorials run a minute and a half or less. This pop parody superstar’s YouTube channel, VenetianPrincess, matches the tone of her work: glitzy and glamorous, larger-than-life, yet not so gem-encrusted and vain that it’s unattractive. The playful colors and cartoonish graphics convey the theme of humor that perfectly matches the content and spirit of her videos. The main featured content is parody music videos of popular songs and artists like Katy Perry’s E.T., Britney Spears’ Hold It Against Me, and Lady Gaga’s Poker Face. The videos are very well done and definitely inspire the laughter they were intended to! In true Mac style, the Apple Channel’s layout is minimal; there is the shiny Apple logo and smooth, even gray all around. The plain layout sends the visitor’s attention straight to the white-framed main content boxes, which features introduction and demonstration videos of Apple products as well as a variety of apps and their uses. 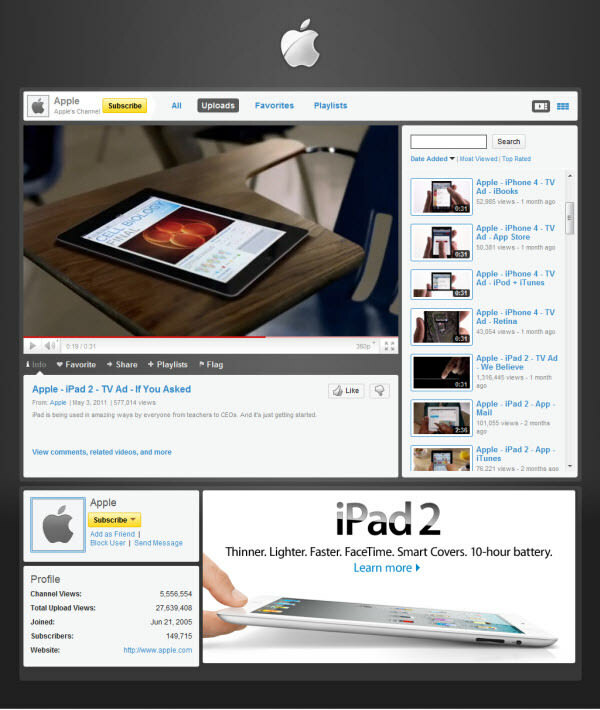 There is also a large advertisement for the new iPad 2 right beneath the rest of the content (at the time of writing) which wraps the whole channel up in a neat little marketing package that reflects Apple perfectly. Rather than having just one YouTube channel, VEVO creates a different channel for each featured recording artist. The channel designs are uniform — a sleek, bold black and white layout with accents of eye-catching red. Featured contents are official postings of professional music videos; such as those found on Lady Gaga’s VEVO. You’ll also find clips from artists’ live concerts, ‘the making of’ videos, and liberal advertisements for Fuse thrown in. The DisneyVideoGames channel features fun game-themed graphics framing semi-transparent content boxes. 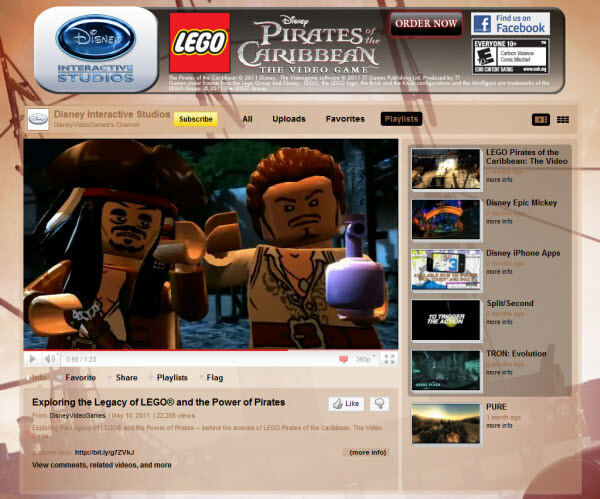 At the time of writing, its background is from the recently released LEGO Pirates of the Caribbean and the video you land on is also a clip from the same game and its creators. 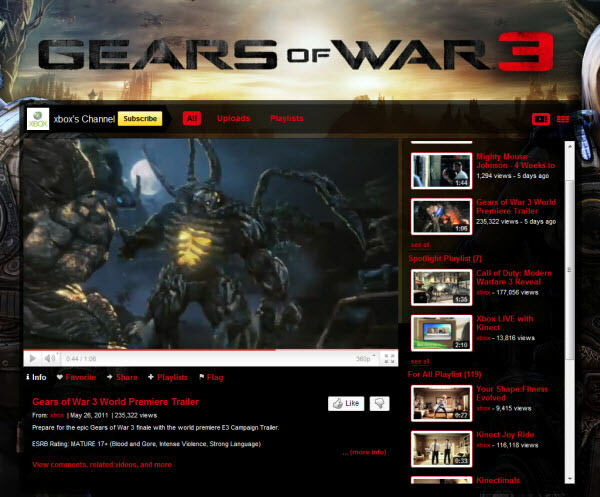 The featured content includes trailers for upcoming games as well as a text window with news feed fed into it. The text is well-utilized by adding hyperlinks throughout and the only real problem I see with the design is that the colors are rather dark due to the transparency which can make some of the text hard to read for those without optimal vision. The official channel for Microsoft’s Xbox and Xbox360 gaming consoles features the Xbox system’s distinctive white and gray color scheme with accents in their signature shade of green. The defining feature of the page is the large mockup of a television screen complete with an Xbox Kinect pictured in the frame, and directly beneath is the Spotlight playlist which draws attention immediately to what’s new and hot with Xbox. Content consists primarily of game trailers, reviews, creation videos and more with neatly organized playlists. Country Pop star Taylor Swift’s YouTube channel features an artistic watercolor-esque background framing soft semi-transparent pink content boxes. The stylized design has ‘young girl’ feel which fits with Taylor’s current pop image and soft beauty. The featured content includes behind the scenes footage and personal video blog messages from the artist herself — a definite draw for visitors. You’ll also find clips of her Speak Now Fan videos where fans document their experience of getting picked to meet and hang with Taylor personally. Visitors expect the channel of a professional digital art tablet company to be impressive, and Wacom doesn’t disappoint them. Smooth multi-layer vector graphics draw the eye to the background, but not enough to distract from the matching colored text in the content boxes. The overall feel of the channel is fun and light-hearted, a feeling you might associate with old memories of sketching by the pond during study period. 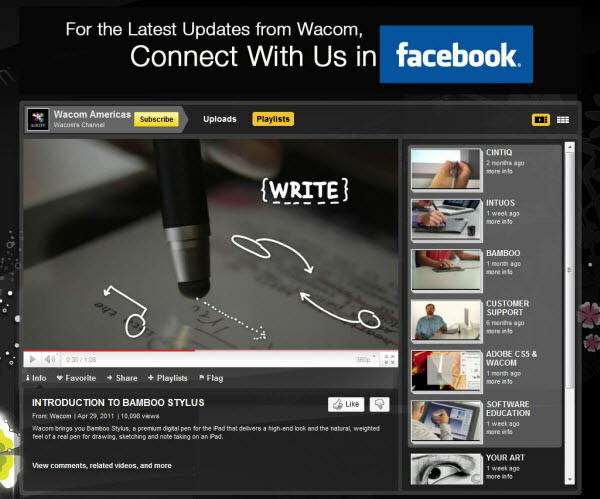 Featured content is demonstrations of Wacom tablets and helpful tips. You’ll also find videos of Wacom drawn art submitted by users, customer support videos and third party reviews not created by Wacom. 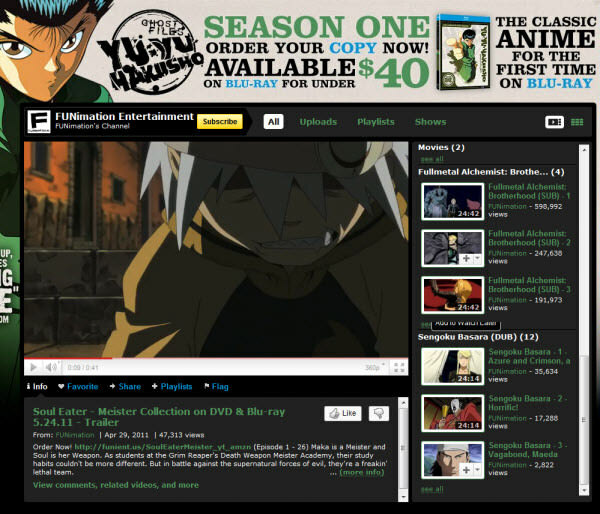 FUNimation, a distributor of Japanese animated series, has a channel designed with (you guessed it) anime’s illustration – the color scheme matches the character pictured, using black and gray with red accents to neatly tie everything together. It’s classic anime style and the only problem with this design is again, the dark color text on a dark background which could hurt the number of visitors that stick around; simply because they can’t read everything on the page easily. A good thing though is they make staying connected via other social networks part very visible and easy to use. This channel features free streaming anime episodes with enough content to feed your anime addiction for days. What works in any graphic design project relies greatly on whose attention you’re trying to get, so always keep the target audience in mind when designing a YouTube channel. I hope you enjoyed these channel designs!